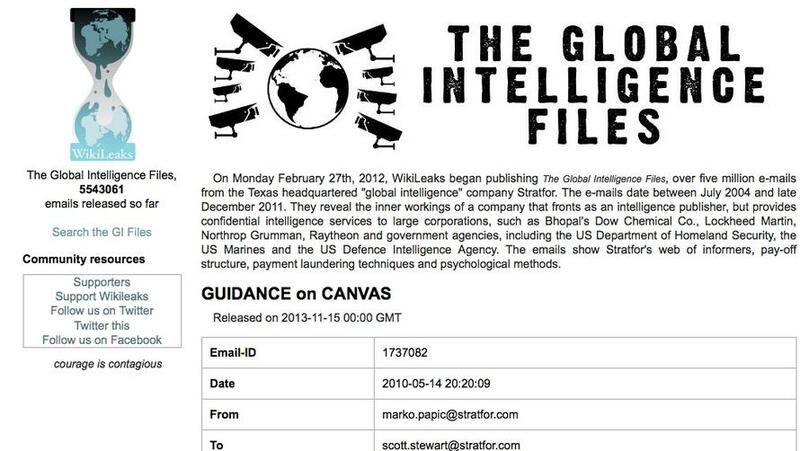 The 2012–2013 Stratfor email leak was the public disclosure of a number of internal emails between geopolitical intelligence company Stratfor's employees and its clients. Thus, not only was U.S. military intelligence advocating for the undermining of democratic and secular forces within the Syrian opposition, it was also aware that the U.S.-backed efforts to undermine Assad would have “bloody” consequences for civilians in Syria. Classified Marine Corps Intelligence memo circulated in September 2011: "the reports of protests are overblown." For much of the last two decades, but especially since the 2006 war between Israel and Lebanon’s Hezbollah, the “resistance axis” — led by Iran — has emerged as the greatest threat to the hegemony of the United States and its allies in the Middle East. A power bloc composed of Iran, Iraq, Syria, Hezbollah, and Hamas in Palestine, the “resistance axis” as a term first emerged in 2010 to describe the alliances of countries and regional political groups opposed to continued Western intervention in the region, as well as to the imperialist agendas of U.S. allies in the region like Israel and Saudi Arabia. Iran’s role as the de facto leader of this resistance bloc makes it, along with its main allies like Syria, a prime target of U.S. Middle East policy. 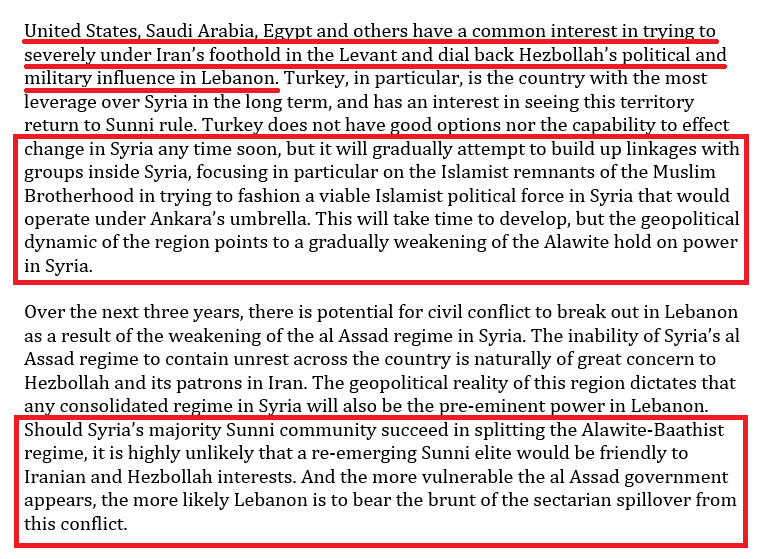 US military intelligence in 2011: "a viable Islamist political force in Syria that would operate under Ankara's umbrella." 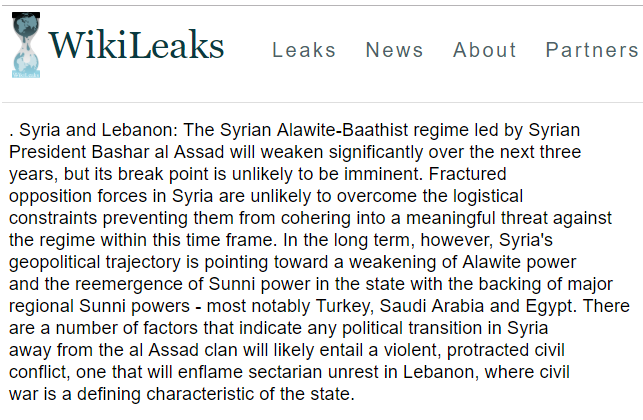 I think our objective should be a new Sunni state out of the western part of Iraq, the eastern part of Syria, run by moderates or at least authoritarians who are not radical Islamists. He asserted that such a country would have “economic potential” as an oil producer, would serve as a “bulwark” against the Syrian government and “Iran-allied Baghdad,” and would help ensure the defeat of Daesh (ISIS). Bolton’s mention of oil is notable, as the proposed territory for this Sunni state sits on key oil fields that U.S. oil interests, such as ExxonMobil and the Koch brothers, have sought to control if the partition of Iraq and Syria comes to pass.